Help people whose lives have been devastated by severe flooding in Mozambique, Malawi and Zimbabwe. The needs of conflict-affected people in Yemen are high. Please help us respond. Your gift will be used by a Foodgrains Bank member where it is needed most—food in times of emergency, longer-term agricultural and livelihoods training, or nutrition education and support. Your gift will be used where it is needed most—food in times of emergency, longer-term agriculture and livelihoods training, or nutrition education and support. Help farm families in Ethiopia, Kenya and Tanzania grow more crops on their land and improve the quality of their soil. Make a recurring monthly gift. Your gift will be used to respond to the needs of people experiencing hunger around the world. 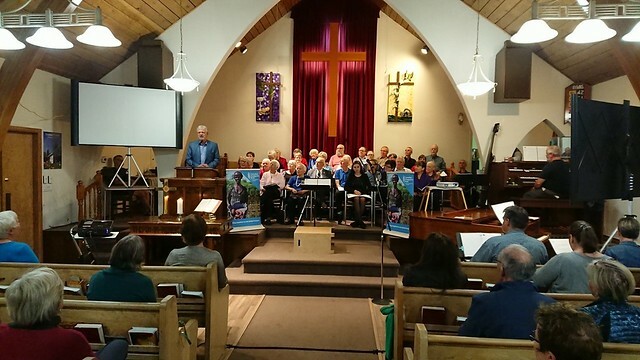 Canadian Foodgrains Bank invites singers, choral conductors, musicians, and other volunteers across Canada to join together and envision a world without hunger. Common Vision is a do-it-yourself concert for your community to encourage action and participation in efforts to end global hunger. There are three different options to choose from with separate music for each of the Spring, Fall or Christmas seasons. The Common Vision resources feature the original music of Ron Klusmeier, but are flexible enough to incorporate other music your community may wish to include. Donations received at the concerts go directly to Canadian Foodgrains Bank, and are eligible to be matched by the Canadian government through Global Affairs Canada to provide emergency food assistance for people in crisis. Project examples include food vouchers for Syrian refugees, or food for families displaced by conflict in South Sudan. Included is an opportunity for each participant in the concerts to add their voice through a simple postcard to show the federal government Canadians care about ending global poverty and hunger. Everything needed to organize and present a Common Vision concert is provided in complimentary resources provided by Canadian Foodgrains Bank and Musiklus. At no cost to your community, these resources include copyright-cleared music for singers and musicians, rehearsal recordings, publicity materials, detailed task descriptions, and more. All that is required is a few volunteers to make a Common Vision concert happen in your community. Click here to indicate your interest in Common Vision – you’ll be put in touch directly with Tami Duff at Canadian Foodgrains Bank and Christina Bogucki at Musiklus who will provide personal support for your event. Did you know one in nine people in the world do NOT know where their next meal is coming from? That’s roughly 800 million people who do not get enough to eat! Canadian Foodgrains Bank works through its member agencies and their local partners to respond to the needs of people experiencing hunger in countries around the world. In times of emergency, such as conflict or drought, we provide emergency food to help in times of need. We also support families and communities who regularly experience hunger in the longer-term through our agriculture and livelihoods work. An area of focus for us is helping small-scale farm families improve their crop production and livelihoods. We also promote good nutrition practices, with a particular focus on mothers and young children. Common Vision is an opportunity to support this work by singing, learning, giving, and advocating. When do we organize our concert? Concerts can be organized at any time – Spring, Fall, Christmas – or anytime that suits you! Utilizing the power of social media, local events will be recognized as an important piece of a larger, nationwide offering. Material and personal support begins the moment you register! Interested? Click here to register for Common Vision. Table Talk is our general Foodgrains Bank email newsletter. Sign up to hear bi-monthly news about global hunger, the work of the Foodgrains Bank, and how Canadians are making a difference in the fight against hunger. Sign up to receive updates about Foodgrains Bank news and activities in your province. Updates are sent by our regional representatives. We create prayers, litanies, and other resources for use in Christian worship services on an ongoing basis. Sign up to receive updates on what’s new and timely. Our Hunger Action Network keeps you informed about opportunities to advocate for an end to hunger and to learn more about the issues around hunger. This includes everything from praying for a specific crisis to supporting you in potentially meeting with your MP. After signing up, we will contact you for optional additional information around advocacy activities you may be willing to take. We provide resources and learning opportunities for classroom teachers, church youth leaders, and other educators about issues related to global hunger. Resources are both faith-based and secular, with some also available in French. Learning opportunities include international learning tours, teachers’ forums, and guest speakers. Sign up to stay informed of learning resources and upcoming opportunities. Increasing and deepening the engagement of Canadians in efforts to end global hunger. Receive news, updates and more. Foodgrains Bank programs are undertaken with the financial support of the Government of Canada. CRA # 118831106 RR0001 Copyright © 2019 Canadian Foodgrains Bank. All rights reserved. Whether you give grain or cash, you can support the relief and development program of your own choosing.